In a digital world, where all the businesses are competing with one another through search and targeting potential customers through social media, it is important that you know well who your competitors are. Link building is the process of connecting your website to the high quality websites around the web. Your page content must be linked to quality blogs related to your content. 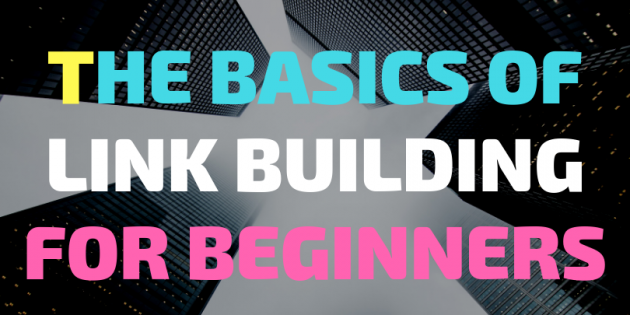 As a beginner in SEO, it is important to know the basics of link building. 1. Is link building worth it? Links value your content visibility on search engines. You would want to make your page easily shown on Google and give people the information they need. 2. Does the links use your keywords? All built links pointing to you website should use the keyword you are targetting. Backlinks pointing to other good quality websites can also gain organic traffic and build trust. There are 2 types of links, internal and external links. 3. Is link building equals to link earning? When you make link building, you are finding the best ranking sites for your own websites to link. Link earning comes naturally. Your page earns without buying or paying something to get it. Your quality content helps you to earn those links. Some ways to earn links are guest blogging, email outreach and social media sharing. Having backlinks cannot be done overnight. I needs a lot of hard work, time and trust from successful links. Natural links – You need to gain trust from other high ranking sites. Truly quality content help a website to build trust but its the PR from the influencers that make you acquire trusted links. Manual links – These links can be gain through the outreach process. You can look on Google and find target users and reach out to them via emails or direct messaging. Self-created links – It is not recommended to make a self-created links because most of them are being abused by SEO experts. Google may ban your website for the too many links created. Paid links – This is another type of links that is being penalized by Google. This practice is just a one time big time success but is not allowed by search engines. 5. What type of inbound links are most beneficial for your site? The best type of inbound links which can help your website are those traffic-generated links. They are not just simple links, but they turn potential customer into a real buyers with this type of links. These sites are most visited by users for comments and sharing reviews about products and services. They help your business to get the attention of those users joined in forums.